MATCO mfg proudly announces a new five inch wheel and internal caliper brake assembly designed for the LSA market --the WI51L. 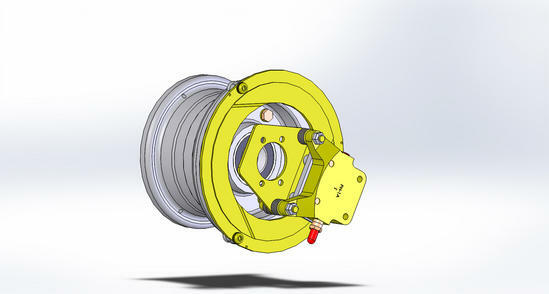 This five inch wheel with a 1.25 inch tapered bearing was designed for use on Light Sport Aircraft. The WI51L is a five inch wheel with a 4.5 inch width with an additional 1.1 inch caliper spacing. Bearing spacing is 2.97 inches and axle spacing is 0.83 inches. The total weight of this wheel and brake assembly is about 5.9 pounds. The bearing axle diameter is 1.25 inch. The WI51L is centrifugally cast utilizing a 535.2 aluminum alloy for superior strength and corrosion resistance.This alloy provides a light weight wheel and affords many years of efficient performance. The WI51L has a 1.25 inch tapered roller bearings with integral seals for a rugged, durable system. This wheel features our new five inch I Series single piston brake assembly for excellent braking dynamics and easy brake maintenance allowing a brake reline to be done in a few minutes. This wheel is designed to use 5.00-5 tires and tubes.